Since the year 2000, the rise in scientific studies on the benefits of science-based mindfulness has led to many valuable insights into the underlying mechanisms and positive effects of mindfulness. From Mindfulness-based stress reduction (Kabbit-Zinn) to mindfulness-based eating awareness (Kristeller, Bear, & Quillian-Wolever) this research is successfully developing valuable interventions to treat a variety of emotional and behavioral issues that could help address some of our society’s current health issues. This growing body of research on mindfulness confirms its effectiveness and emphasizes that it successfully improves people’s well-being. Mindfulness directs the attention to the experience in the present moment in a non-judgmental way. Integrating mindfulness into your client’s daily life promotes their psychological health, especially when they experience lots of stress or pressure in their personal or professional life. Higher levels of mindfulness reduce stress and induce several positive outcomes, such as greater life satisfaction, lower levels of depression and anxiety, and more self-esteem and self-awareness. Mindfulness research has also made the availability of many programs and resources widely accessible to helping professionals across all fields. The latest in mindfulness training, Mindfulness X, has been developed in the Netherlands by Dr. Hugo Alberts (Ph.D.) – psychologist, researcher, and entrepreneur. With over 20+ academic publications on Mindfulness and Positive Psychology, he has been exploring the practical and scientific side of mindfulness for the past 10 years with an aim to increase mental well-being through the practice of mindfulness. Mindfulness X is a complete training package for practitioners who want to increase mindfulness through mindfulness practice while uncovering the underlying mechanisms of mindfulness. What are the effects of mindfulness? Why does mindfulness increase well-being? How is the acceptance of emotions different from suppression and distraction? Understanding such mechanisms makes it easier to apply mindfulness in a wide range of contexts and counteract the common misconception that mindfulness is a trick or technique, rather than a way of being. (claims are backed up by research and references). The program helps you to better understand how it works and why it can create a more balanced life. The goal of this template is to give you all the tools needed to teach your clients to become aware of their thoughts, emotions and bodily sensations in a way that they can relate to them non-judgmentally. Helping your client to practice mindfulness while teaching them the psychology behind it can cultivate an open state of mind. 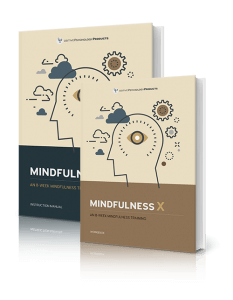 By combining the practice and psychology behind mindfulness, Mindfulness X allows trainers to apply a science-based mindfulness approach to their client base by dividing mindfulness into eight different building blocks. As a practitioner, you will understand the most important pillars of mindfulness and learn to explain and implement them into clear and precise, science-based training sessions. How can I safely practice mindfulness? How do I prepare for my mindfulness training? How do I create an optimal learning environment for my clients? What is the right attitude of the trainer? How do I guide meditations? How do I evaluate exercises? How do effectively deliver a presentation? This course will teach you to give your participants the skills necessary to integrate mindfulness into their daily lives and gain a deeper understanding of the essence of the construct itself by giving them the psychological perspective that has proven to increase mental well-being through the practice of mindfulness. In simpler terms, Mindfulness X was developed to help you help others! Are you ready to improve your client’s life and well-being? You can sign up for Mindfulness X here. Note: this training is not a substitute for a certification program. We recommend you to take one before seeing clients and to use the material only within the boundaries of your own professional expertise.